First, What’s So “Super” About The Superadios? 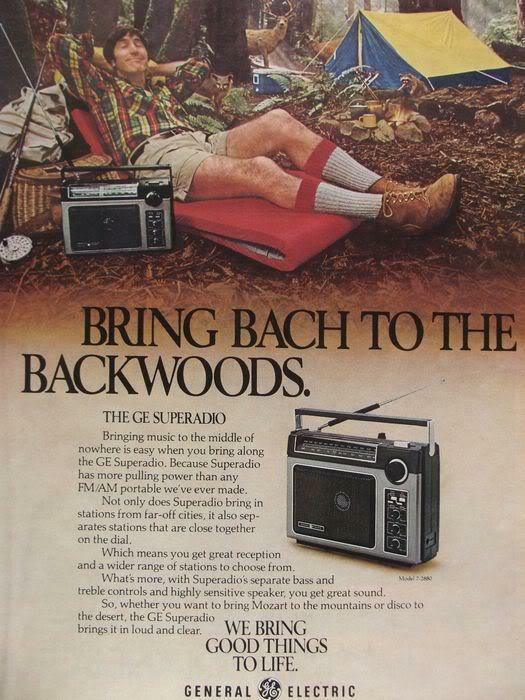 The GE Superadios are classics of simple yet excellent design in a portable AM/FM radio. 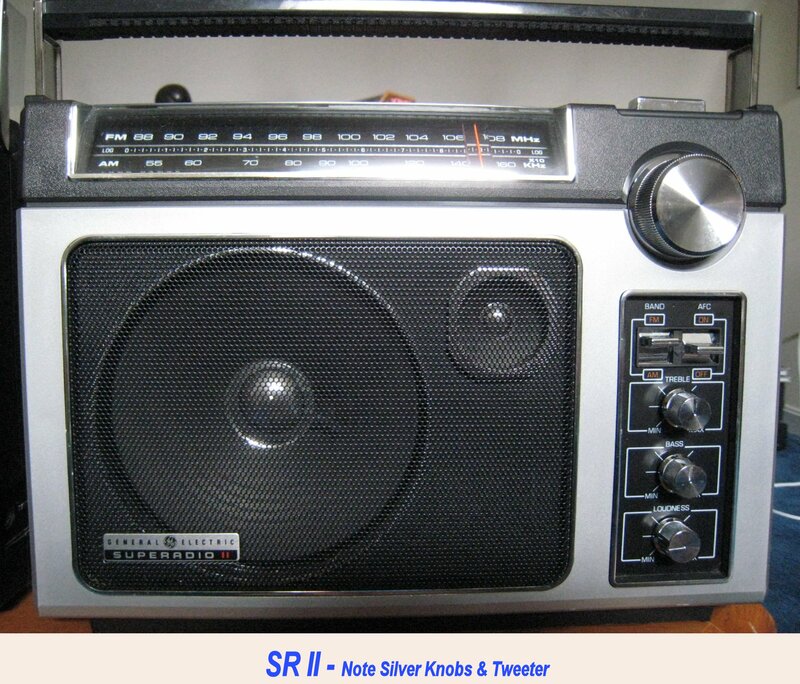 Generally retailing at or below $60 over their long production runs between approximately 1979 to 2008 they were far and away the best performing radios one could obtain anywhere near that price level, both in terms of AM RF performance and sound quality. FM performance is good but not stellar as the AM is. All three SR models contain an unusually large (7 ¾”) ferrite rod AM antenna, tuned RF stages on both AM and FM, 4 AM IF stages and 3 on FM plus a ceramic filter. They feature full rich audio and incredibly long battery life on a set of 6 D cells, or they can be powered by their built in AC power supply. 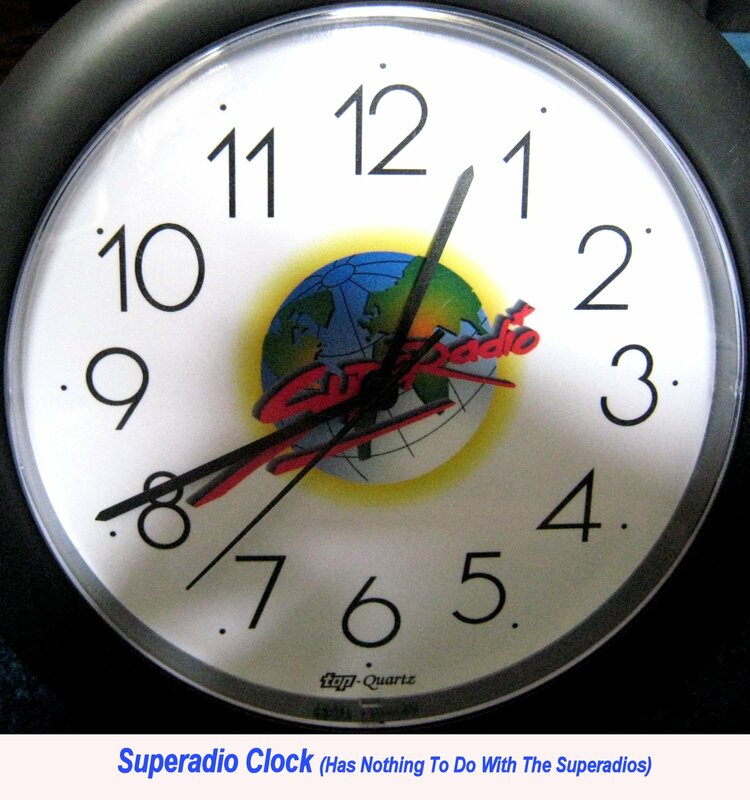 I initially became aware of the last of the three major models…the Superadio III in the mid 90′s. 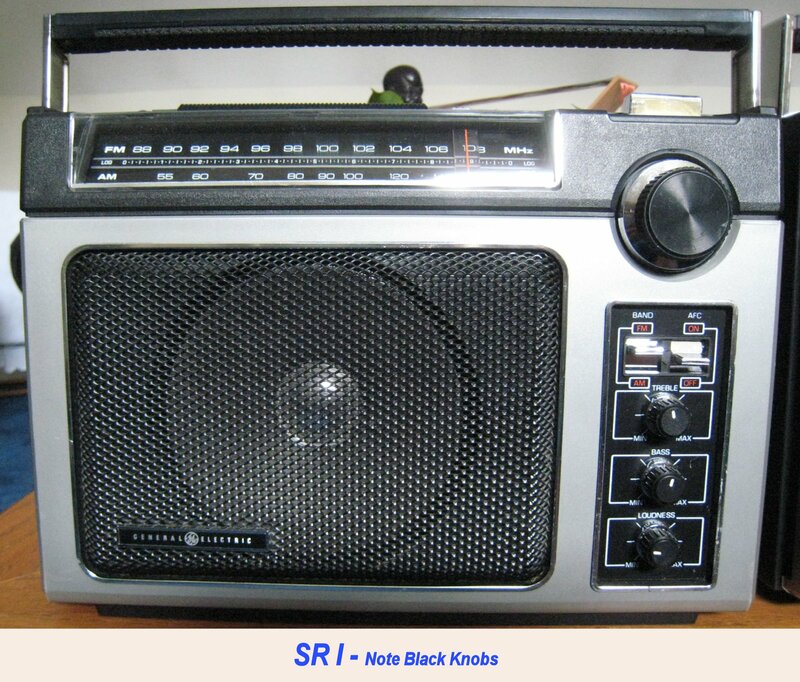 In many ways the SRIII turns out to be somewhat of a step backwards from its predecessors the SRI and SRII but it is still a great radio for the price. The III does however have one unique feature…a true AM Wideband mode which allows strong AM signals to sound like FM with full range frequency response you don’t get on most AM radios. This wide bandwidth option is often misunderstood by those who complain that it “ruins the radio’s selectivity” when that’s exactly what it is supposed to do. It disables the usual IF bandwidth filter (necessary to separate closely spaced signals) to allow the full broadcast audio bandwidth to be heard, so if you have a strong AM signal with no sideband interference, it will indeed sound like an FM station. This is truly remarkable if you have never heard your favorite AM station with full frequency response before. Back in the old days of fewer stations many radios had wider bandwidth audio because extreme selectivity was less of an issue, and some of those radios sounded remarkably clear and lifelike on AM, but today the SR III is unique in a consumer level portable with the inclusion of this feature. The SR III also tunes the expanded AM band up to 1710 KHz which the older models do not unless modified…more on that later. 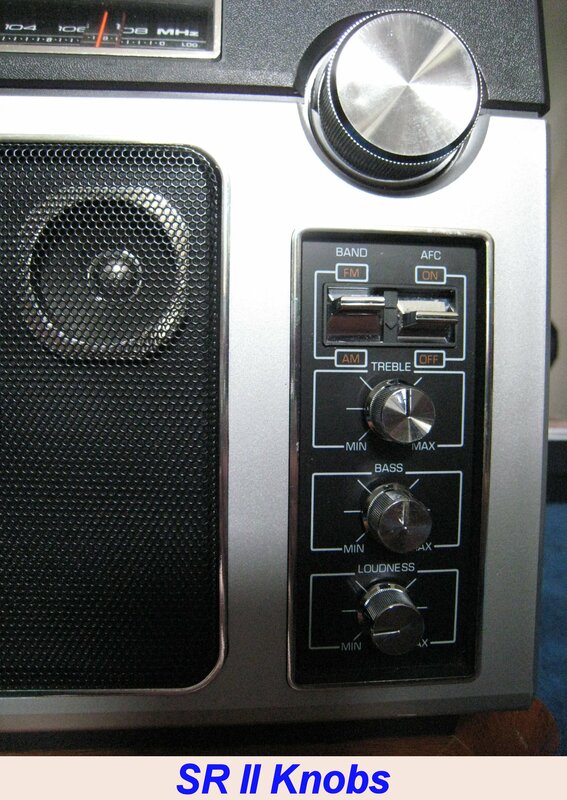 The very earliest Superadio I’s (prior to the 7-2880 B version) did not have external antenna connections on the back, and the On/Off and band select switches were gray plastic rather than chrome as on all following models. Unfortunately, in almost every other way the III does not quite measure up to the older SR I and II which both offer a lower noise floor on AM for increased sensitivity to weak signals with less circuit hiss on even medium strength signals. This is generally considered to be due to the varactor tuning used in the III rather than the traditional variable capacitor used in the older models. The SR I and SR II also feature obviously sturdier physical construction quality and somewhat easier to read dial scales. The SRI also has differently designed volume, bass and treble control knobs with shoulders around their shafts which make them feel very sturdy and free from any wiggle, whereas those knobs are free to wiggle a bit on the II and perhaps even a bit more on the III. That’s not usually a problem really, but the sturdy feel of those knobs on the I is a joy once you’ve compared them. On the other hand some owners like the looks of the II over the I because it has a bit more chrome and a different speaker grille design…I won’t take a position on that…I like them both. 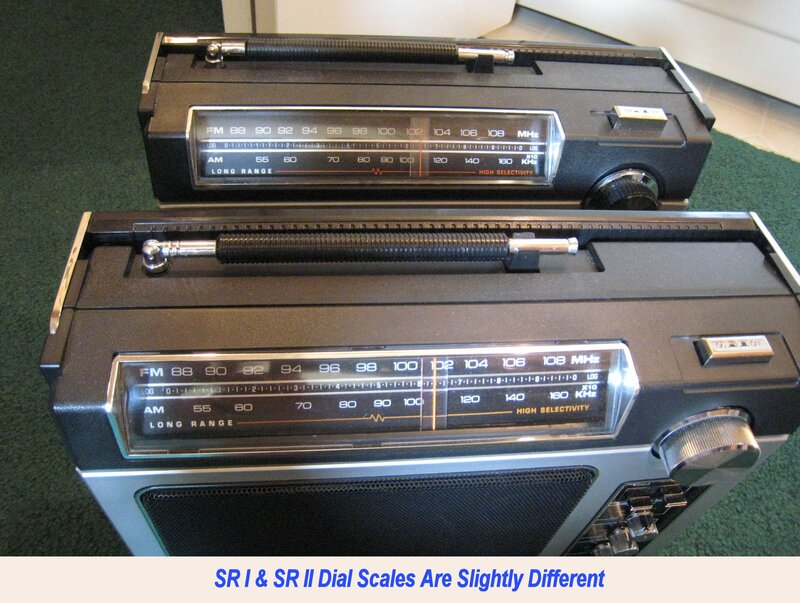 I’m not bashing the SRIII…it is still an excellent radio for its price and I have recommended them often, but if you are a radio fanatic as I am and compare a III with a I or a II you will find that those older models are quieter on medium to weak AM signals bringing them in with a lack of background noise that is impressive. Also the older models just seem sturdier overall. If you have an SR III don’t despair…an inexpensive passive loop such as the Terk Advantage AM will bring the AM reception of the III virtually to the level of a I or a II. (I have written a few reviews of various AM antennas here on radiojayallen.com you may find of interest). 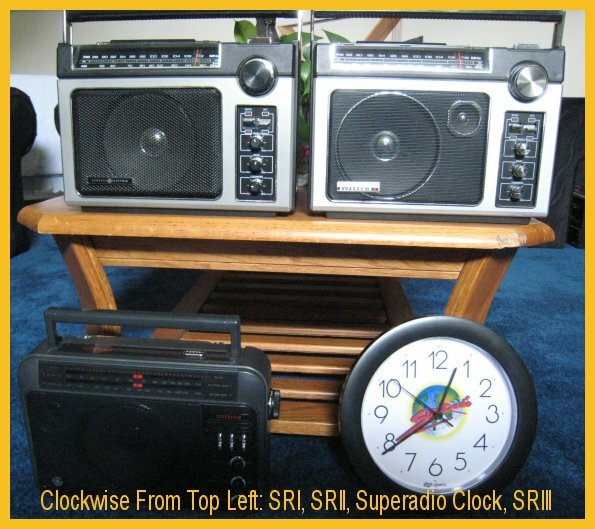 I am lucky enough to own all three Superadio models and to have worked on and compared them extensively – I have settled on the I and II as my favorites. They are generally available in decent condition on eBay for $60 – $100…although a like-new-in-box SRII just sold for around $350 on eBay – those boxes can become expensive! 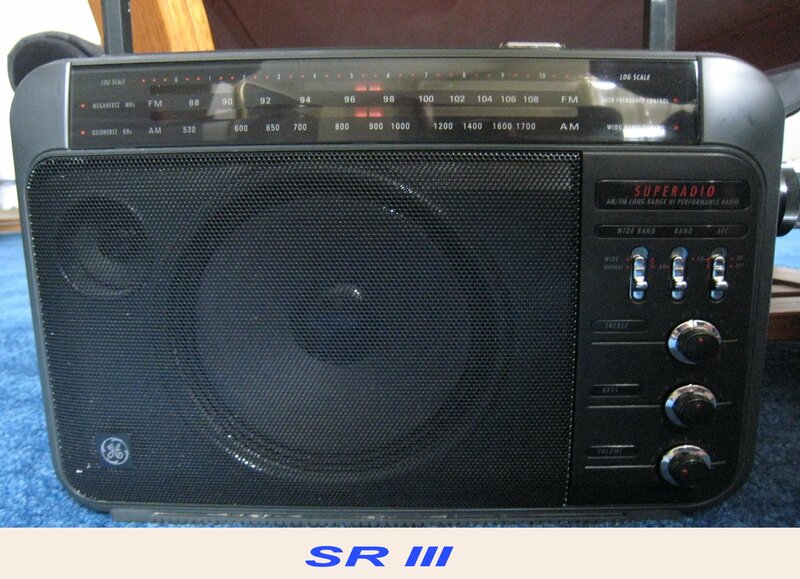 The SR I and II offer AM reception that is virtually as good as it gets in ANY portable radio at ANY price. They also sound far better than most portable radios. Those are strong statements but I own a large collection of radios and there are only a handful that actually pull in AM signals better than an SR I or II. One that does is the well-known Panasonic RF-2200 but that is a more expensive radio which also includes SW and has the advantage of dual bandwidths, yet still it’s only a hair better than the GE’s. Plus it does not match the audio quality of the GE’s so the SR’s can still hold their heads high even if the Panasonic is a tad better at digging tough DX catches out of the ether. More recently the excellent C. Crane CC-2, CC-2E and CC-3 match or beat the Superadios in overall AM reception and trounce the vintage GE’s on FM due to their much improved selectivity. However, if you happen to live in an area bombarded with many extremely strong AM signals the vintage radios resist overload better than their modern counterparts, so once again we see no one radio is best at everything. 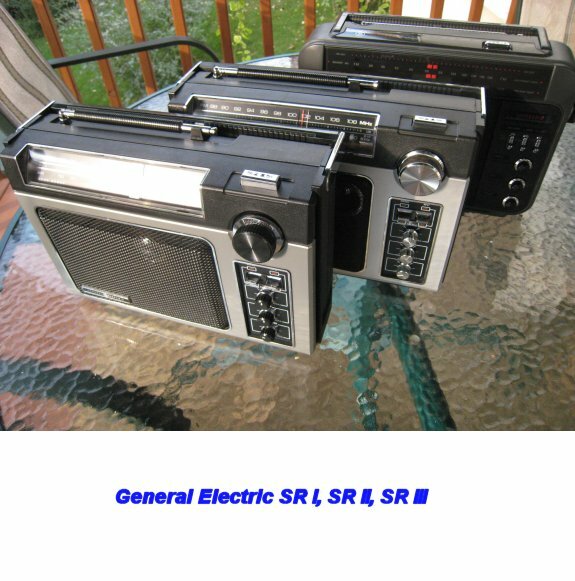 There were a few other GE models which are said to be based on the Superadio design, at least one with a cassette deck built in and one with a digital front end (Model 7-2888A). I have not evaluated any of those so I can neither verify nor deny that they fully match the performance of the Superadio series although it seems likely that an early design digital front end would probably compromise performance at least a bit, even as the varactor tuning on the SR III took a slight toll on performance. There were also several Radio Shack SR III clones sold under the Optimus name but they were actually similar, not identical designs. Internet sites point to the fact that some were close but not quite the equal of the “real” SR III. One obvious example is the use of a shorter ferrite rod antenna but also note they had completely different circuit boards inside. If you’re referring to the usual passive AM loops and even the C.Crane Twin Coil Ferrite Antenna, that’s mostly, but not completely correct. Why? Because the SRI and II are so sensitive on their own that they generally are said to “hear right down into the band noise”. What that really means is that in most cases your reception on an SR I or II is limited by interfering signals and noise from outside the radio…increasing the signal level therefore does not result in improved reception quality. There are exceptions – during bandscans I have found some weak signals which were improved by the careful use of a passive loop and I just reviewed the larger MTM Scientific Loop which due to its larger capture area does improve the SR’s a bit more than smaller passive loops I have tried. Most of the time though, the SRI and II do as well on their own as other radios do with the help of a loop. Again, the SR III does improve quite a bit more with a loop and will essentially match the weak signal capabilities of the SRI and II. As for outdoor antennas, all the SR’s with the exception of the earliest versions of the I (prior to model 7-2880-B) have external antenna screws on the rear. I have had very good results with modest random wires of about 40-50 feet and a good ground. I haven’t tried these radios with a more ambitious antenna…at any rate the internal ferrite rod will always be active so hard-core DXers with sophisticated antennas will look elsewhere. The SR’s are portables first and foremost and were never meant to compete with communications receivers. It’s not bad at all but it’s not “Super” like the AM is. These GE’s are all about AM performance. Their FM reception has good sensitivity and certainly is more than adequate for typical listening, plus their wonderful audio is great for FM…most users will be entirely satisfied with it. However FM selectivity is only average – I have other portables that beat the SR’s on subtleties of FM reception. Why Do Some People Prefer The Original SR Over the SR II – Isn’t the SR II Improved? The fact is that if you compare the schematics you will find that the SR (I) and II are very similar overall, the major difference being the addition of a tweeter on the SR II. The problem is that due to individual variations, some SR II’s have way too much tweeter output. Although most have been OK I have seen this issue a few times. When the tweeter is too loud it adds a ton of noise (but very little program information) on AM, especially noticeable at night. And on FM it can make the sound downright sizzly and bright. Turning the treble control down doesn’t fully compensate for this. I found in one such SR II the solution was to add a 330 ohm ½ watt resistor in series with the tweeter (the tweeter is 140 ohms by the way). Not a textbook solution, but in the context of a portable radio, it resulted in much more natural sound. The tweeter still adds some sparkle to the sound on FM but the treble no longer overshadows the midrange, and AM sounds much smoother and freer of noises, especially at night. Again, most SR II’s sound like my modified SR II without needing the modification so evidently there are variations in tweeter level going on. Also note…the tweeter contributes very little to AM listening on the SR II…it’s frequency range is higher than what comes out of the radio’s AM tuner so on AM an SR (I) and II should sound virtually identical. Only on FM does the II offer a bit more crispness in the high frequencies. I find that overall the SR and SR II perform so identically it is very tough to discern any meaningful differences, except for that subtle difference on FM sound quality. How Do I Tell If My SR II Tweeter Level Is Too High? You probably won’t have this problem as I’ve only seen two radios with this issue, but the easiest way to tell is to use FM interstation hiss with the tone controls centered. If the hiss coming from the tweeter seems out of proportion and much louder than the hiss coming from the larger driver it is probably too loud. When I was experimenting with resistor values to put in series with the tweeter I found the value where the tweeter just added a bit of extension to the hiss coming from the bass/midrange driver…that is the way it should be. Remember…the tweeter should extend the frequency range of the high frequencies…not boost them excessively. This is a bit subjective of course……if you get to this point try a 330 Ohm resistor and see what you think. You will be rewarded with much more balanced audio on FM and much less noise on AM at night. 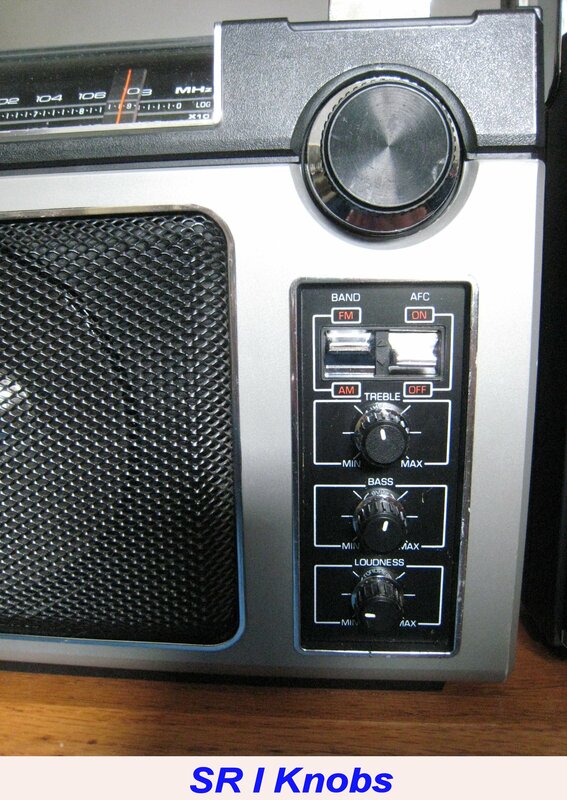 As with all vintage radios and even most new ones, these are subject to some unit-to-unit variability. Of course any older electronics are likely to have drifted out of optimum alignment as components subtly change value with age…this is a given. Even when new SR III’s were still being sold I personally saw huge differences with some samples performing far better than others. I work at a group of radio stations which owns several SR III’s to be used during remote broadcasts, and at one time a group of us got together for a group purchase of a dozen units for ourselves. We found that some worked much better than others on AM or FM. I aligned several and was able to get them to improve but two of twelve had to be exchanged for new samples that worked better. I have also serviced many SR’s and SR II’s and even though alignment almost always improves them to some degree, they still differ a bit afterwards. Luckily I have seen less variation on the I’s and II’s than I saw on the III’s, especially very early and late production III’s which had some quality control issues so you will probably be able to find one that works quite well. I don’t know how to advise the average user in this except to make you aware of it…my best advice is to buy from a seller with a good reputation so if you feel performance is not what you expect you can return it and look for a better one. The good news is that overall, most SR and SR II’s work very well as found and many users will find them to be just fine as received. However, a compete alignment usually improves their sensitivity, dial calibration and selectivity. The SR’s have a nicely chosen bandwidth for the average program listener…it is wide enough to allow good clarity in the audio but just narrow enough to give decent selectivity…however if the IF’s are slightly out of alignment that selectivity suffers and you may notice increased interference from neighboring signals, especially at night when the band is typically full of many strong signals. A tightly aligned IF is therefore important. On a positive note I have found the majority of SR’s and II’s need no actual repairs to function normally. I have never yet had to replace a failed cap in an SR and so far I have seen only one with a bad transistor, although certainly that could always happen. But it appears these radios are solid and dependable so you have a good chance of getting one that works well compared with many vintage radios which suffer far more reliability problems. I have run into an oddity in some samples of the SR’s which is worth discussing…I found a work-around for it but it took consultation with a few knowledgeable friends who explained what was going on. Essentially, when performing the IF alignment I found that the first two IF’s on several samples were not having the usual effect on my 455 KHz test signal. The signal just stayed constant while I adjusted the coils, although I could hear the associated noise peaking sharply. The explanation was that the test signal was being picked up directly by the third and 4th IF’s, so adjusting the 1st and 2nd had no effect on it. The easiest solution is to peak the first two IF’s to the noise as carefully as you can, and IF’s 3 and 4 on the 455 KHz signal. Then either tune to a very faint signal or radiate a very weak signal with your RF signal generator and carefully peak all 4 IF’s. I have even gone back and rechecked 3 and 4 on the 455 KHz tone afterwards. Again this may not be a textbook way to do it but I can tell you from experience that it works very well. You could also inject your IF test signal directly being careful to decouple it with a small value cap, but you still risk detuning the circuit if you do it this way. You’ll have to use your intuition to see if you are getting a reliable result. When the IF’s are tightly peaked, sensitivity and selectivity are maximized. The differences between an as-received SR versus a carefully aligned one are sometimes very noticeable if you compare two samples critically. For the casual listener you may not notice the difference. Don’t Break The Power Switch! It’s very easy to do…I’ve done it and I’ve fixed one too. As you separate the front and rear halves of the cabinet the front half tries to pull the power switch forward and literally pulls the switch apart. The best solution is to remove the Power knob first – I use pliers with tape wrapped around the jaws. Then push the switch down but still watch out for it. Alternatively you can simply hold the switch down with the knob in place while you disassemble but this is tricky. You have to also be careful when you re-assemble. If the switch does pull apart it can often be re-assembled. Please see the detailed disassembly instructions at the end of this article before you proceed! Dial Calibration – What Station Is That? The SR’s are often criticized for their poor dial calibration. Luckily they can be improved with alignment. Again, I have gotten better results with I’s and II’s than with III’s. The dial is not as precisely marked as on some more expensive receivers, but nevertheless most of the SR’s and SR II’s I have seen end up being spot on across the dial. In other words, checking frequency accuracy at 55, 60, 70, 80, 90, 100 and so on up the dial it is possible to get most SR’s to be dead on. Others deviate only a very small amount and I think this is fine for this class of radio. I have occasionally had to slightly adjust the pointer’s position of the dial string to change its overall position slightly, but in most cases only electronic adjustments were needed to get both AM and FM correct. The III’s, with their varactor tuners are more complicated and don’t always end up being quite this good but they can usually be gotten reasonably close. I’m going to state up front I am not a believer in this kind of thing…the SRI and II were designed to top out at 1630 KHz (per the service manuals) and that is the way I calibrate mine. However for many people the inclusion of the expanded band up to 1710 KHz is important and I suppose if I had a favorite station in that range I might agree with them. It is certainly easy enough to change the calibration of these radios so they will reach up to 1710…of course you will have to accept less than ideal dial calibration if you do that, although one website actually provides a new dial scale as a solution. Whether or not you can actually achieve an original-looking appearance with this is another matter…I expect most tweakers will simply re-calibrate their radios and live with the poor dial calibration. I only hope no one will do that without checking the entire AM calibration afterwards because if you merely change the top end adjustment you will lose performance overall. Sadly the General Electric Superadios have now passed into history and it appears there are not likely to be more. The good news is that many were made and they are readily available used and in fine condition. There are also many on-line sources of information on the SR’s…do some searching and you will wind up with hours of enjoyable reading and valuable background information. 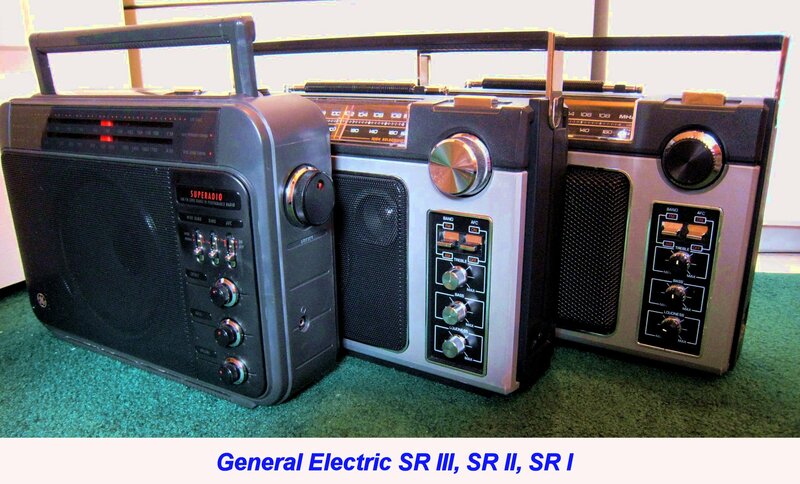 The GE SR’s represent what may well be the best bang-for-the-buck in portable AM/FM radios of all time…they are classics all and for AM listening they are among my favorite of all portable radios. These apply to all GE Superadios. Extreme care should be taken to avoid damage. 1 – Pull off 4 knobs from the front. They are a friction fit and will pull off. (Of the many SR’s I have worked on, one gave me a problem with the tuning knob. It was so tight that the tuning shaft came off with the knob. When this happened, I then separated the knob from the shaft and was able to snap the tuning shaft back into place. Nothing was broken and I did not have to restring the radio. This is very unlikely to happen to you but proceed slowly and with caution). 2 – Turn the tuning shaft so its flat portion is towards the bottom of the radio…this will give you slightly more clearance when you remove the front panel. 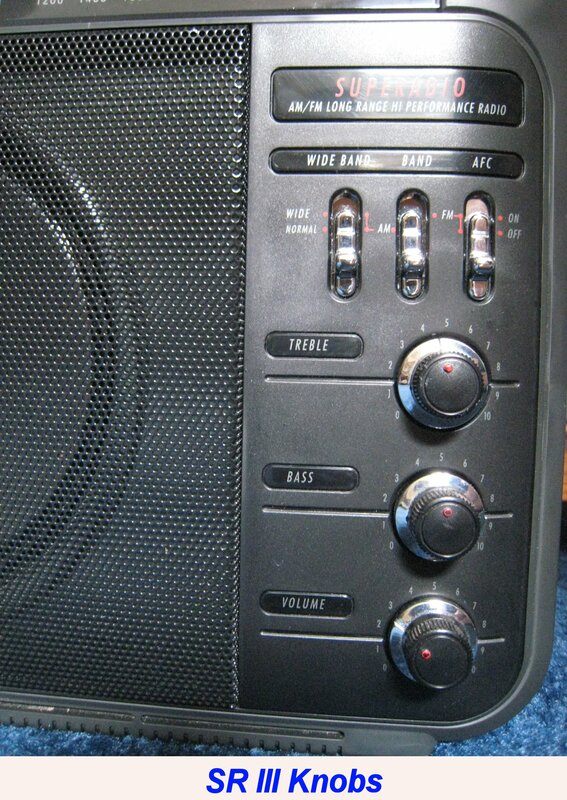 2 – Pull off the Power Knob on the top. Use tape, cloth or a piece of rubber to prevent marring the chrome plated finish. I use a rubber gripper intended for opening jars and it works well for this. 3 – Push the power switch down to make front panel removal easier. 4 – Remove 6 screws from back panel – one is in the battery compartment. 5 – CAREFULLY separate the front and back halves of the cabinet starting at the bottom. While doing so pay attention to the power switch. As you swivel the front panel up and away from the back do not let it pull forward on the power switch…that is how the switch can be pulled apart. If you do pull the switch apart it can usually be re-assembled but obviously this is best avoided. 6 – The speaker(s) are attached to the front panel but there is enough wire to lay it face down next to the radio while you work on it.